Supermarketwala, Damodar Mall's intriguing and revelatory debut book, answers these questions and much more. Damodar, in Supermarketwala, provides the very basics for the growth of modern retail and consumerism in India, through interesting and carefully studied consumer behaviour, an art that few in his domain possess. 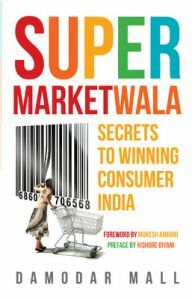 Supermarketwala, is intended to be the go-to book for all consumer business enthusiasts and readers alike, who wish to understand how and why we as consumers behave in a certain manner at different places. These insights, which are the analyses of the sector so far, could become the pillars for shaping successful consumer products and retail businesses in the huge consumer economy that India will soon be. Rita, the young bahu, avoids buying personal products from the family grocer. Sonu's breakfast table on a Sunday represents global cuisines. Do you know how it is possible? Where do big corporates and MNC retailers fumble, and what helps simple DMart get its model right? What is Ching's Sercret that is not Knorr's, Maggi's, or Yippie's? Damodar Mall is an Indian retail sector professional. He is Chief Executive Officer of Reliance Retail’s Value Formats and has been the customer strategy officer of Reliance Retail Ltd. He is the Ex-Director, Integrated Food Strategy at Future Group. He was a part of Kishore Biyani’s core strategy team. Damodar Mall is a business graduate from IIM, Bangalore and an engineer from IIT Bombay. He won the gold medal in marketing at IIM Bangalore. He has earlier been responsible for promoting a supermarket chain with R.K. Damani in 1999-2000, which flourished into the 60 store D-Mart chain in western India. He has also headed the first phone order supermarket, Sangam Direct for Unilever in 2003. He has been instrumental in shaping Big Bazaar and Food Bazaar for the Future Group. Damodar writes an invitation blog ‘Shopkeeper-In-Law’ for Forbes India. He has written columns for the Economic Times, DNA, Times of India, amongst others. He was profiled by Mint, a business daily in 2007. Damodar Mall was a part of the Coca-Cola Retail Research Committee of Asia from 2006-2009. He is the recipient of the Golden Spoon Award for the most admired Food & Grocery retail professional of the year, in 2011.